led the celebration with a morning dedication and ribbon cutting. 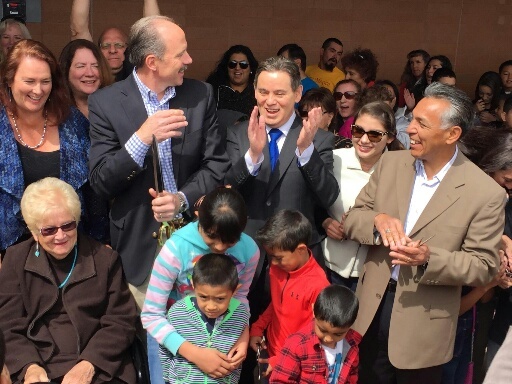 The building is named after former City Councilor and County Commissioner Pat Baca, who worked tirelessly for the west side and was a constant supporter of open space, education and libraries. The new building sits on the northwest corner of Central Avenue and Unser Boulevard and will be open 7 days a week. The address is 8081 Central Avenue NW 87121. The Children's Activity Room is named after Lawrence Charles Vargas, whose family created "Shoes for Kids," a charitable organization providing shoes to children, in his memory. In the spirit of its location on historic Route 66, the 3' high letters which spell out LIBRARY on the building are backlit with LED lighting that cycles through the full spectrum of color at night. Funding has come from City, State, and County bonds as well as over $1.2 million in private donations. Over $5 million dollars is from City Bonds and City Councilor Ken Sanchez' district set aside. Work on the building began in November 2013 and was completed on time, meeting the projected opening of the building in spring 2015.The Freedman Trust was created from the generous bequest of Richard A. Freedman to purchase books and create reading rooms in the Albuquerque public libraries. This grand opening could not have been made possible without the efforts of the Westside Community. Councilor Sanchez held a charrette with the community in 2007 for the vision of the NW corner at Central and Unser. An educational component was included in the vision.Thank you to all of the members of our community who made this Library a reality.